We’d love your help. 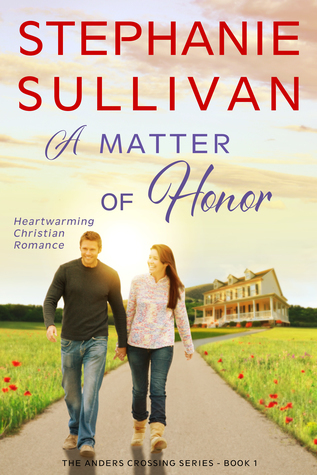 Let us know what’s wrong with this preview of A Matter of Honor by Stephanie Sullivan. Joey Landry is stuck between a rock and a hard place. After inheriting her late aunt's bed-and-breakfast inn, she has the overwhelming task of keeping the struggling business afloat while also trying to raise her twelve-year-old disabled son, Evan, on her own. Nathan Griffin, a handsome businessman and farmer from Texas, stops by on his way through Louisiana and decides to Joey Landry is stuck between a rock and a hard place. After inheriting her late aunt's bed-and-breakfast inn, she has the overwhelming task of keeping the struggling business afloat while also trying to raise her twelve-year-old disabled son, Evan, on her own. Nathan Griffin, a handsome businessman and farmer from Texas, stops by on his way through Louisiana and decides to spend a few days at the inn, despite the fact there's a hurricane brewing in the Gulf of Mexico. Joey is immediately taken with his friendliness and southern charm, but what she doesn't realize is he's been sent to spy on her by his ruthless and wealthy boss, who wants to buy Joey's property to drill for oil. Nathan, who never wanted to take part in the deception in the first place, never expected to meet such a strong and admirable Christian woman as Joey Landry, and he certainly didn't expect to fall in love. Nathan refuses to go along with his boss' wishes, but fearing he might lose Joey, Nathan never confesses to her the false pretenses that brought him to her small town of Anders Crossing. To ask other readers questions about A Matter of Honor, please sign up. Ms. Sullivan is an outstanding writer who provides a beautiful love story. The town is described so eloquently, and the characters built on a solid foundation of Christ. I felt honored to have a peek into the lives of Anders Crossing because it is a small town which has much to teach the world. I highly recommend the writing of Ms. Sullivan and the love found in Anders Crossing. I hope it is the first in a series I will surely pick up and read. Ful Ms. Sullivan is an outstanding writer who provides a beautiful love story. The town is described so eloquently, and the characters built on a solid foundation of Christ. I felt honored to have a peek into the lives of Anders Crossing because it is a small town which has much to teach the world. I highly recommend the writing of Ms. Sullivan and the love found in Anders Crossing. I hope it is the first in a series I will surely pick up and read. I couldn't put it down once I started reading it. I felt what the characters were feeling. I laughed, I cried, I even got angry at one of the characters. I would recommend this book to teens to 90's. Loved it!!! I loved this book! Believable characters and lots of emotion. I couldn't put it down, and I look forward to reading more of this author's work in the future. As a teenager in the 1980s, Stephanie Sullivan fell in love with romance novels after borrowing a friend’s copy of Betray Not My Passion by Sylvie F. Sommerfield. This began a mail correspondence with Mrs. Sommerfield that lasted several years, and those letters of encouragement are just a few of the many reasons why she chose to pursue her lifelong dream of becoming a romance author. She lives in As a teenager in the 1980s, Stephanie Sullivan fell in love with romance novels after borrowing a friend’s copy of Betray Not My Passion by Sylvie F. Sommerfield. This began a mail correspondence with Mrs. Sommerfield that lasted several years, and those letters of encouragement are just a few of the many reasons why she chose to pursue her lifelong dream of becoming a romance author.